One of the distinct advantages of flying with the 281st was the diversity of missions. One month it was combat and the next “ash-and-trash”. When working out of Nha Trang you never knew what you would get. One such mission was a day of flying in the Dalat area. I don't remember what we were doing that day but at the end of the day we were commandeered by the local high brass and ordered to fly a “Special” mission that was on the way back to Nha Trang. 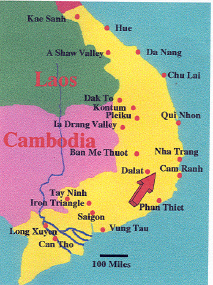 It seems that a very large number of enemy troops were spotted between Dalat and where the plateau started down to the ocean. The ARVN had sent out recon teams but could not find them. Our mission was to take two ARVN Generals and insert them at a specific spot designated as such on their map. Both Generals seemed angry that they had to go but were determined that they could find the missing enemy troops. I protested because we don't do single ship insertions without backup and guns. Besides, it would put us close to dark and that would mean flying back home at night. Didn't work and their U.S. counterpart ordered us out. With the two Generals and their U.S. counterpart was a young reporter. He asked if he could catch a ride to Nha Trang and I said sure, hop on. The reporter was dressed in civies and carried a small machine gun along with his cameras. I figured he was a friend of the American. I found the insertion spot they wanted and set the ship down next to the tree line. The Generals hopped out and ran into the woods and we were gone. No shots were fired and we were on our way home and about to get a little nighttime logged. I turned the ship over to the peter pilot when I got a tap on my shoulder. It was the reporter. He looked me square in the eyes and said, “Do you think those guys need this?” In his hand was the General's map. We weren't very far from the insertion point so back we went and landed hoping the Generals were still nearby and hoping one would come back for the map. They didn't come out. Just then the reporter said he would go in and try to find them. I said OK but he only had a couple of minutes at best. Into the woods he went and about two minutes later he came back with a big smile. As soon as he got in we were out of there. I asked him what he did with the map and he said the Generals were sitting under a tree just inside the tree line arguing over who forgot the map. He figured they were too embarrassed to come out and get the map themselves. We joked about the mission the whole way back. I asked the crew chief and door gunner if they would have gone into that tree line with the map. They said no-way. I told the reporter he should have put in for combat pay on that one. We got back to Nha Trang with about 30 minutes nighttime and another story to tell our kids about. I wonder if that reporter ever wrote about that day?